(Nanowerk News) The President's Budget for Fiscal Year 2016 provides $1.5 billion for the National Nanotechnology Initiative (NNI), a continued Federal investment in support of the President's priorities and innovation strategy. Cumulatively totaling more than $22 billion since the inception of the NNI in 2001, this funding reflects nanotechnology's potential to significantly improve our fundamental understanding and control of matter at the nanoscale and to translate that knowledge into solutions for critical national needs. Nearly half of the requested budget is dedicated to applications-focused R&D and support for the Nanotechnology Signature Initiatives (NSIs), reflecting an increased emphasis within the NNI on accelerating the transition of nanotechnology-based discoveries from lab to market. The NSIs are multiagency initiatives designed to accelerate innovation in areas of national priority through enhanced interagency coordination and collaboration. 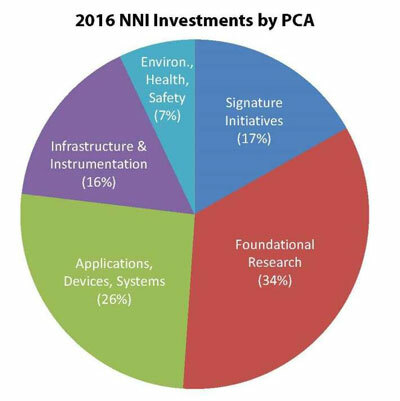 Furthermore, the NNI has continued to grow its hallmark environmental, health, and safety (EHS) activities, which now account for more than 10% of the NNI's total budget (7% in dedicated EHS investments, plus approximately 3% in additional EHS-related investments within the NSIs). "Right now, the NNI is focused on innovations that support national priorities, while maintaining a strong foundation of fundamental research in nanoscience," says Dr. Michael Meador, Director of the National Nanotechnology Coordination Office. "Our goal is to create an environment to foster technology transfer and new applications today, while supporting the basic research that will provide a continuing pipeline of new discoveries to enable future revolutionary applications tomorrow." The President's 2016 Budget supports nanoscale science, engineering, and technology R&D at 11 agencies; another 9 agencies have nanotechnology-related mission interests or regulatory responsibilities. The NNI Supplement to the President's 2016 Budget documents activities of these agencies in addressing the goals and objectives of the NNI. To view the full document, visit hwww.nano.gov/2016BudgetSupplement (pdf).